The University of Maine’s goalie Jeremy Swayman makes a save during the game against the University of New Hampshire at the Alfond Arena in Orono in this Jan. 21, 2019, file photo. 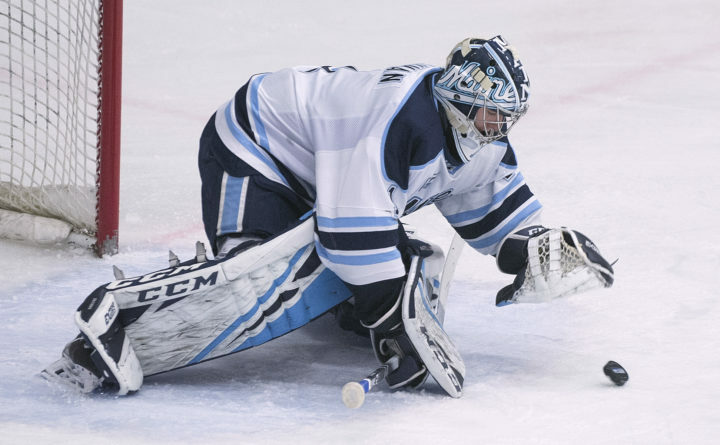 There were high expectations this season for the University of Maine men’s hockey team. A year ago, the Black Bears finished fifth in Hockey East and swept New Hampshire in the first round of the playoffs — after being picked to finish 10th in the preseason poll. But after being overachievers last season, the Black Bears were underachievers during the 2018-19 season. UMaine had a 15-17-4 overall record and finished sixth after being chosen fifth in the Hockey East preseason poll. 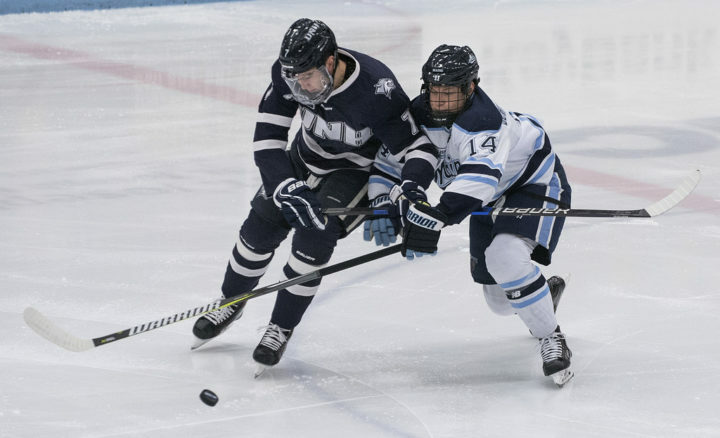 The Black Bears were swept by Northeastern in the league quarterfinals by 2-1 scores despite outshooting the third-seeded Huskies 76-49 and having 53 more shots blocked. UMaine wound up with an 11-9-4 Hockey East regular-season record. There were positives for coach Red Gendron’s team. UMaine went 8-4-2 in its past 14 regular-season games, and its conference record was the best in Gendron’s six seasons. It had a 6-5 regular-season record against the four Hockey East semifinalists: Massachusetts (1-2), Northeastern (0-2), Boston University (2-1) and Boston College (3-0). That included a victory over then-No. 2 UMass, and Providence, which owned a 15-game winning streak against UMaine. “I’m really pleased with the way the team played down the stretch. That was hugely positive,” Gendron said. “The way we played at Northeastern was amazing. We were the better team, but their goalie was a big factor is us not advancing,” he said. However, a program that reached the NCAA Frozen Four six times in nine years between 1999 and 2007 hasn’t even advanced to the Hockey East semifinals since 2012. The Black Bears have mustered only two winning seasons since 2012 and have lost nine consecutive Hockey East playoff road games. “I’m not pleased about our season coming to an end as quickly as it did. We aren’t satisfied,” Gendron said. With the exception of penalty-killing (84.9 percent efficiency rate), there was not another aspect of their game that was consistent this season. UMaine ranked 42nd among 60 Division I teams, scoring only 2.5 goals per game, and its power play was miserable (14.9 percent, 49th) despite returning eight players off power-play units that converted 19.5 percent last season. Six of the nine forwards on its top three lines scored fewer goals this season than last. UMaine was also victimized by defensive lapses, allowing 2.75 goals per game to rank 29th. Sophomore goalie Jeremy Swayman had a decent year but was inconsistent. The 2018 Hockey East All-Rookie selection did hold opponents to two goals or fewer in seven of his past nine starts. He allowed one goal in 10 games and two in seven others this season, but he also surrendered at least three goals 18 times including four or more on seven occasions. Swayman has elite ability and a tremendous work ethic, but the Boston Bruins draft pick’s goals-against average (2.77) and save percentage (.919) were slightly worse than 2017-18 (2.72, .921). Looking ahead, it’s hard to envision the Black Bears climbing the league standings. Second-leading point producer and two-year co-captain Chase Pearson, the top line center, and sophomore defenseman and third-leading scorer Brady Keeper have signed pro contracts. They also lose seven graduating players including defensemen Rob Michel (3 goals, 6 assists), Sam Becker (1 & 6), Keith Muehlbauer (0 & 6) and left winger Brendan Robbins (9 & 5). Pearson, a junior, was the only double-digit goal scorer (16) and posted 13 assists. Keeper, a sophomore, provided 7 goals and 15 assists. UMaine is expected to return two-thirds of its top line. Junior left wing Mitch Fossier led the team in scoring for the second straight year (8 & 28). He had four fewer goals but six more assists than the previous season, while sophomore right wing Eduards Tralmaks (8 & 9), provided eight fewer points than 2017-18. Junior center Tim Doherty (9 & 8) had six fewer points and sophomore left wing Emil Westerlund (6 & 3) had four fewer than during the 2017-18 season. Junior center Patrick Shea (4 & 10) matched last year’s point total, and junior right wing Ryan Smith (6 & 3) improved his output by three. Sophomore Jack Quinlivan (2 & 2) was a reliable fourth-line player. Freshmen RW Jacob Schmidt-Svejstrup (6 & 8) showed promise as did LW Adam Dawe (1 & 6), who played in only 17 games due to multiple concussions. Dawe, the smallest but most physical player on the roster, was particularly missed on the power play. Sophomores Kevin Hock and Adrian Holesinsky, freshman Edward Lindelow, and Niagara transfer Sam Rennaker will vie for playing time up front. Fourth-line regular Danny Perez (1 & 2), center Canon Pieper (0 & 3) and goalie Rob McGovern, who shut out BU in his only start, also graduate. Gendron will have to rebuild his defense with four players leaving. They return three dependable blue-liners in sophomore Alexis Binner (2 & 9), freshman Simon Butala (0 & 2) and freshman Jakub Sirota (1 & 4). Sirota joined the team for the second semester, and displayed an offensive flair and good poise with the puck in 18 games. Sophomore Veli-Matti Tiuraniemi played in only six games because of injuries, but will be back along with Cam Spicer (4 games). The defense should get immediate help from 6-foot-4, 205-pound University of Wisconsin transfer J.D. Greenway, a third-round draft pick of Toronto. Levi Kleiboer also will contend for time on the blue line. Up front, A.J. Drobot, Ben Poisson and Brady Gaudette should supply some scoring punch. Goaltending should be a strength as highly touted Vancouver seventh-round pick Matthew Thiessen will join Swayman and improved junior Stephen Mundinger.